Due to the cold and snowy weather in New York this year, I don’t feel I trained properly for the NYC Half Marathon. I avoided the overly cold days or days it snowed, but I still got my long runs in prior to the race. I got up to ten miles two weeks before the race and as it warmed up the few weeks before the half marathon, I got in some extra runs. In the dark early hours Sunday morning, I met the members of Team Determination in the Apple store at the south end of Central Park. From there, we entered the park and hit a large crowd. It seems metal detectors were set up at the entrances to the park and everyone was forced to slow down and walk through it. We were asked to take out phones, iPods, and other devices, but since everyone had one, so we all set off the detectors and kept going. It was a useless gesture of security that did nothing but make people think they would be late to their corrals. When the second wave was started, I was off. The race started with a three mile run up the east side of Central Park. 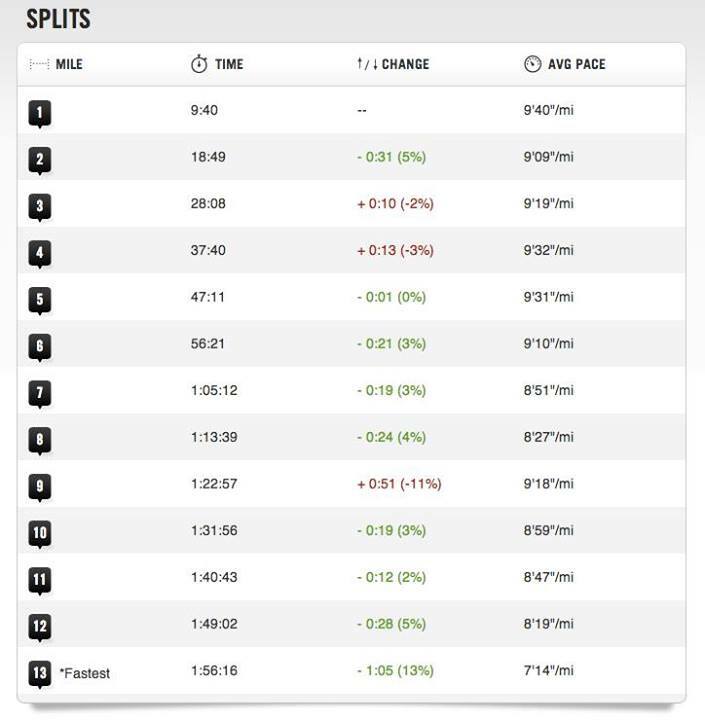 I found a comfortable pace to run, but as I was passing the mile markers, I noticed the time per mile on the clocks were slowly slipping lower. Mile three took us outside of the north of the park and looped around to reenter the park and run about three miles down the west side of the park to the six mile marker. After leaving the park, we enter the best part of the race, straight down Seventh Avenue – into the heart of Times Square. We ran through “the heart of the world,” where I saw some of my DetermiNation teammates cheering at 43rd Street, and turned right at the end of the seventh mile. 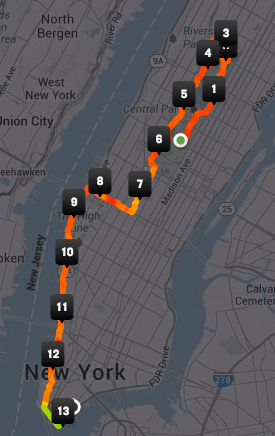 For a mile, we ran west on 42nd Street to the west side highway. The west side highway is a fairly long stretch of road that tends to be the most boring part of the race. A straight run down to mile 12 with a slight decline. It was good to see some of my coaches while running, a couple of whom jumped in for a little bit to run beside me and give a little pep talk, and some of my teammates were cheering at mile 10, which was just as energizing. 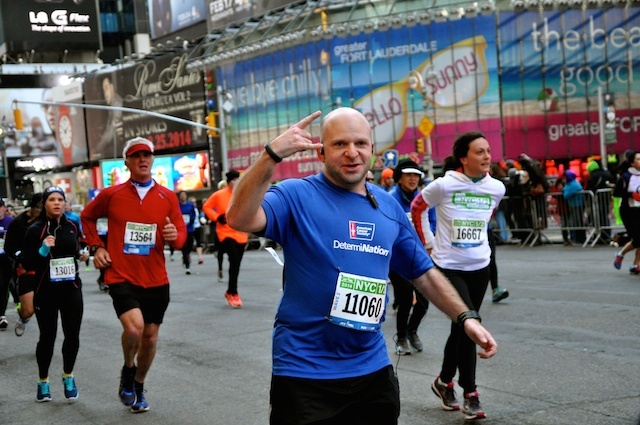 At mile 12, we entered the tunnel that connects the west side highway to the FDR and looped around to Water Street, and straight down to the finish line. I felt good running the whole race, and had planned to do about ten minute miles, but when I was out there and feeling good, I started running negative splits (except for Harlem Hill) and was able to do it for most of the race, giving me a finish time of 2:01:11, a time much better than I had planned on. The NYC Half Marathon may be the best half marathon course I have run, and this year’s run for me just incentivized me to run better for all the other races I have planned this year.